It was another fairly quiet week on Sanibel with late-day summer rains continuing and not much real estate action over the last seven days. Just had the electricity in the office go on and off multiple times as I was trying to post this blog. Those folks who scooted out early on a Friday afternoon had the right idea as a huge rain is dousing Southwest Florida now (4 p.m.). 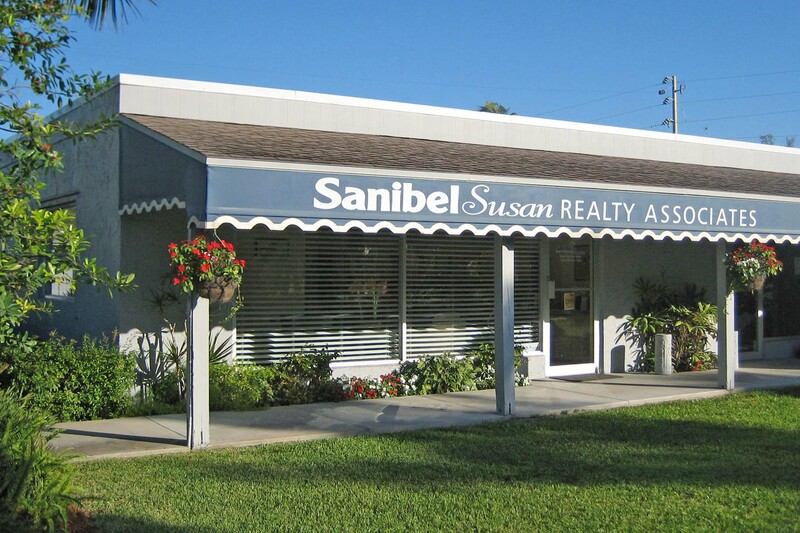 In the real estate world, The SanibelSusan Team had another nice closing on Tuesday, the charming olde-Florida home with guest house, separate garage, and resort-style pool at 375 East Gulf Dr. Due to building code restrictions, we don’t see many multi-building residential properties like it on Sanibel. Since it dates back to the late 50’s, before City incorporation, it has some wonderful and unusual features. Wednesday, we also had a walk-in looking for an entry-level income-producing condo at Sundial and we continue to receive inquiries about where to rent next winter. There aren’t many vacancies left! Teammate Dave and I had a couple of listing presentations this week which resulted in two new listings – both pool homes. One, a split-plan 3 bedroom 2-1/2 bath near the beach in Little Lake Murex has an amazing wide and long lake view. 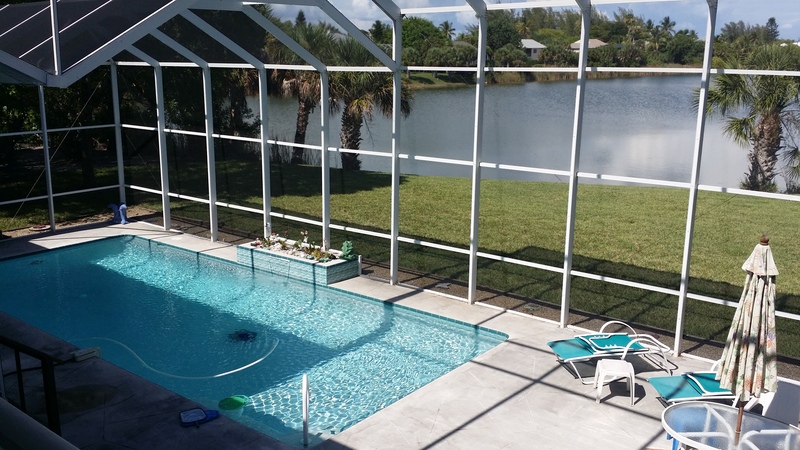 The other, a large 5-bedroom 4-bath in gated Laguna Lakes with amenities, is just off-island. It was another week without a Thursday Association of Realtors® Caravan Meeting, but there will be one next week when our new listing at Sunset South #9C is on the schedule. Little real estate activity has been posted in the Sanibel/Captiva Multiple Listing Service since last Friday. Compared to “high season” when we may see as many as 15-25 island properties go under contract in a week, this week there were just five: a single Sanibel condo and four homes, three on Sanibel and one on Captiva. Those details follow a few news items below. “Florida’s economic growth in 2014 outpaced the national average, the U.S. Bureau of Economic Analysis reported Wednesday. Goods and services produced in Florida increased 2.7% last year compared with 2.2% nationally, the bureau said. “Growth in Florida topped all states east of the Mississippi River except West Virginia where the economy jumped 5.1% thanks to its mining industry, said BEA spokesman Thomas Dail. “Florida’s economy, meanwhile, has benefited from strong growth in real estate and rental and leasing, Dail said. Florida, with more than triple the national growth in the real estate sector, was behind only North Dakota, the federal data showed. “”There has been fairly strong contributions from retail trade as well,” Dail added. Florida had nearly double the national growth in the retail sector and was behind only Arizona, Washington and North Dakota, according to BEA’s numbers. “Overall, Florida’s economic growth ranked 11th in the nation – good enough to beat any state touching the Atlantic – including New York, Massachusetts, Virginia and Georgia. “The one bleak spot: Florida’s per capita share of the economy – the state’s output of goods and services divided by its population – continues to lag the nation’s. Last year, Florida’s was $38,690 vs. the nation’s $49,049. Florida has yet to recover to its pre-recession high of $44,048 in 2006. “Florida has been rebounding from a deep recession since 2011, when the state’s economy actually contracted 0.6%, federal data shows. Goods and services grew only 1.7% in 2012, below the 1.9% national average. 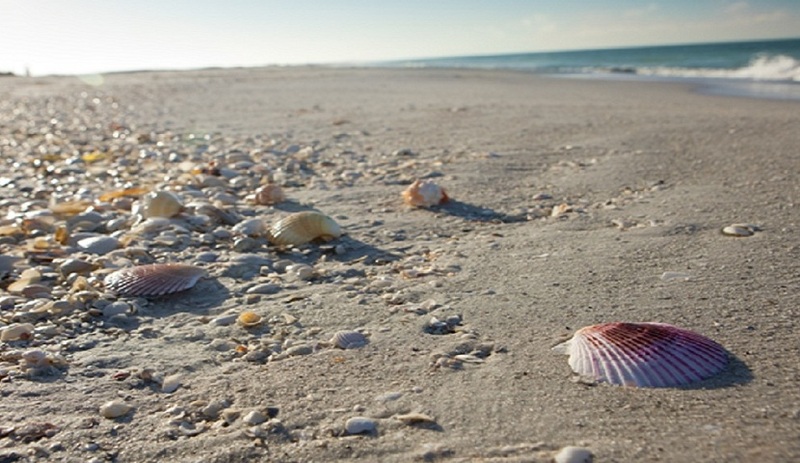 “The sister islands of Sanibel and Captiva are something of a special breed in Florida. You won’t find bustling theme parks, water parks or alligator attractions on these islands. There won’t be long lines of sweaty tourists or beaches thronged with sunbathers either. In fact, these islands with their fertile unspoiled habitats seduce visitors without even trying. “The islanders like to think the appeal is in the numbers: 15 miles of beaches, 25 miles of bike paths, 50 kinds of fish, 230 kinds of birds, 250 kinds of shells and their favorite number of all—zero traffic lights. Sanibel alone is home to 6,400 acres of mangrove wilderness, which is almost half of the total island. Many visitors just come to spend time in the J. Ding Darling National Wildlife Refuge—a birders paradise, but also an ideal place for nature hikes and the occasional alligator spotting. 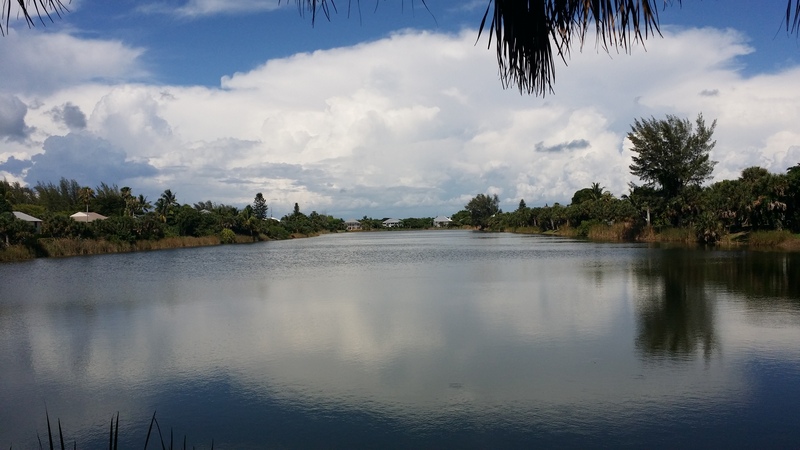 “Sanibel and Captiva (which are connected by a short causeway) also have a few simple guidelines in place that keep this wildlife-rich paradise as pristine as it was when I first visited as a young girl almost 40 years ago. The island allows no weekly home rentals (although smaller condominiums can be rented weekly) and no developer, no matter how deep the pockets, is permitted to build a structure higher than three stories. “Yet, most people really don’t care about the rules; they come for the uncrowded beaches and unparalleled shelling. During my first visit as a child, my father and I decided to go shelling in the rain. We discovered the most magical things on that gloomy day–lighting whelks, king conch, shark eyes–even the occasional fish or horseshoe crab washed ashore by storm tide. Our pockets bulged with loot. I felt like an explorer, alone in the beachy wilderness. The adventure remains one of my most treasured memories with my dad to this day. “In the following years I’ve taken my own babies down those beaches—each walk its own treasure hunt. Shelling on Sanibel is a rewarding pursuit simply because it yields intact shells—the ones with critters have to go back—but the empties are yours to keep. Of course you can sunbathe, or just drift in the gentle waves, but busy bees like me find the shelling hard to ignore. “The island is threaded with bike trails and it’s a great way to get around or just explore sections you haven’t yet seen. I prefer biking through the wildlife refuge to driving—one always sees more when you slow down—and see you will. 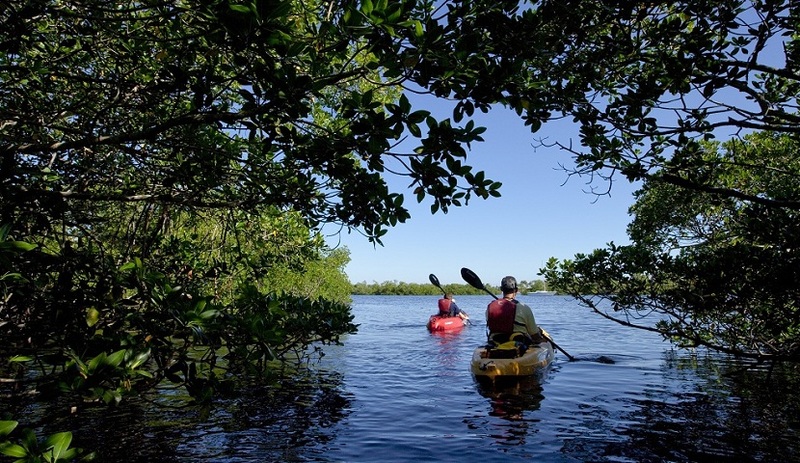 You can also take a guided tour by kayak through the refuge or through the mangrove forest. (Tarpon Bay Explorers offer several options led by naturalists). Expect to see a wide range of wildlife including dolphins, manatees, alligators, anhinga, pelican, and more. “Shoppers won’t be disappointed, nor will those who just eat out every meal…Sanibel and Captiva have enough of both options to keep visitors busy for weeks without ever having to return to the dreary “mainland”. “Today I go for different reasons—my mother, who lives there now, is aging and we spend more time shuttling her to the hospitals in Ft. Myers than shelling or kayaking. But, on each trip the wildlife still give–I’ll spy an anhinga drying its wings, or a pelican diving for dinner, and shells still wash ashore. Maybe that’s why people come back year after year—the island never changes–and you can feel, if only for a while, that you haven’t changed either. The Sanibel Sewer Expansion Program is moving into Phase Four which is the last portion of the program which included centralization in 1974 and consolidation of island wastewater in 1991. The program is about 99% complete with 42 properties in Phase Four remaining to be converted from their current septic systems. A low flow exemption has been granted to 28 properties, which will remain on septic for a temporary time period, which allows these properties to remain on their systems until they fail. The construction of Phase Four is estimated to take three off-seasons with the potential of being completed in just two. A more firm timetable will be established for City Council’s July meeting. Sanibel’s Bennett’s Fresh Roast is encouraging children to read while out of school for the summer. The shop is offering donuts in exchange for reading. Through August 31, school-aged children, from kindergarten through 5th grade, may receive a complimentary fresh donut each time they read a book at Bennett’s. Children may receive one free donut per day before 4 p.m. when they read a book while accompanied by a parent. Books appropriate for children are available for reading on-site. Certificate of Excellence Hall of Fame Winner. Customer Satisfaction Index of 98.2 when rated for value, rooms, service, cleanliness, and location. Hall of Fame Award for their unique vacation experience. 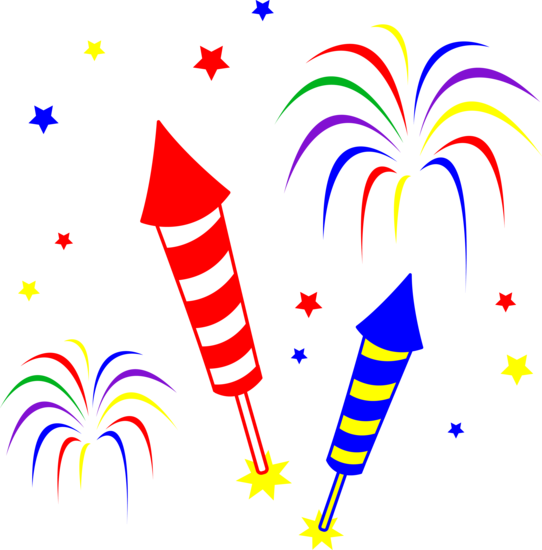 The 4th of July is on Saturday this year. Here are the events promoted in today’s “Island Sun”. 25th Annual Independence Day Parade – themed “For The Fun of It”. Parade line-up begins on Island Inn Road at 8:30 a.m. & the parade begins at 9:30 a.m., traveling from Island Inn Road to Tarpon Bay Road down Periwinkle Way to Casa Ybel Road. Commemorative T-shirts are available at Bank of the Islands and will be sold along the parade route. 36th Annual Road Rally – sponsored by Sanibel-Captiva Optimists Club, teams puzzle out clues while following a prescribed driving course around the island. Prizes are awarded for correct time and mileage, the most correct answers to the quiz about things seen along the route, as well as best decorated vehicle. Entry forms available in various locations around the island. Fee covers car, driver, navigator, unlimited crew, and includes one official Road Rally T-shirt (additional shirts available for $15). Rally begins at Timbers Restaurant/Sanibel Grill parking lot at noon, and ends there for the “after-glow party”. Starting times are staggered. All proceeds provide funds for college scholarships. Next year, for the first time, J.N. “Ding” Darling National Wildlife Refuge will hose the Federal Junior Duck Stamp judging. 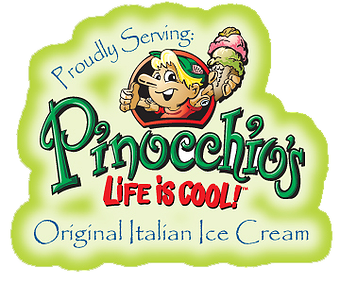 The public is invited, so mark April 22, 2016 on your calendars, and stay tuned for news of other activities in the planning stages. 1 new listing: Somerset #B201 3/2.5 $1.95M. 2 price changes: Captains Walk #B4 2/2 now $315K, Blind Pass #G203 2/2 now $485K. 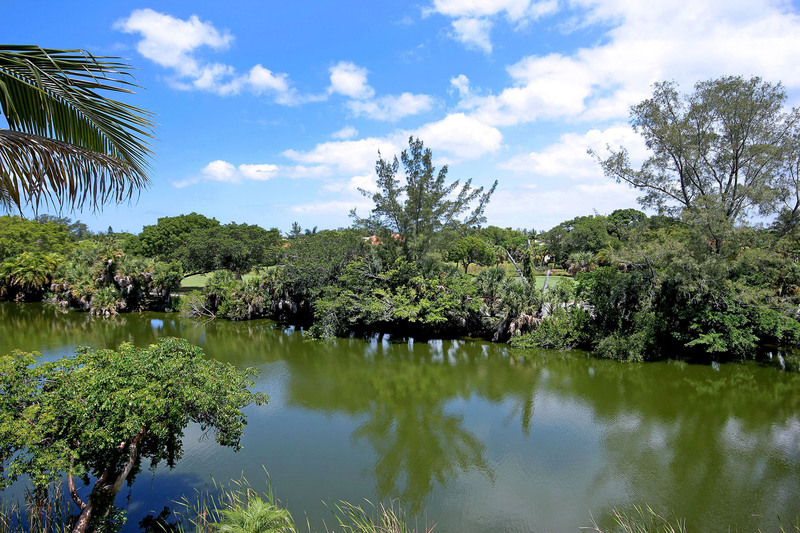 1 new sale: Sanibel Arms #E7 1/1 listed for $339K. 5 closed sales: Colonnades #41 1/1 $185K, Sundial #H109 1/1 $315K, Seawind #A106 2/2.5 $450K, Sundial #J401 1/1 $465K, Lighthouse Point #231 2/2 $640K. 5 new listings: 1314 Tahiti Dr 2/2 $525K, 1388 Tahiti Dr 3/2 $679K, 887 Casa Ybel Rd 4/3 duplex $699K, 597 Lake Murex Cir 3/2.5 $749K (our listing), 689 East Rocks Dr 3/3 $768.5K. 3 new sales: 1599 Sand Castle Rd 3/2.5 half-duplex listed for $489K, 4515 Bowen Bayou Rd 3/2 listed for $585K, 2999 Twin Ponds Dr 4/3.5 listed for $865K. 5 closed sales: 536 Boulder Dr 3/2.5 $650K, 820 Sand Dollar Dr 3/2 $950K, 375 East Gulf Dr 4/3 $970K (our buyer), 6170 Dinkins Lake Rd 3/3 $1.575M, 428 Bella Vista Way 4/4 $1.6M. 1 closed sale: 915 Main St $150K. 1 new listing: Beach Villas #2525 2/2 $649K. 1 price change: Tennis Villas #3111 1/1 now $249K. 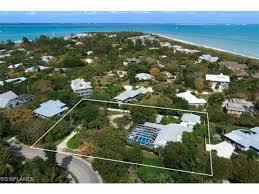 1 new listing: 16237 Captiva Dr 5/5.5 $3.95M. 1 price change: 1105 Tallow Tree Ct 3/3 now $2.049M. 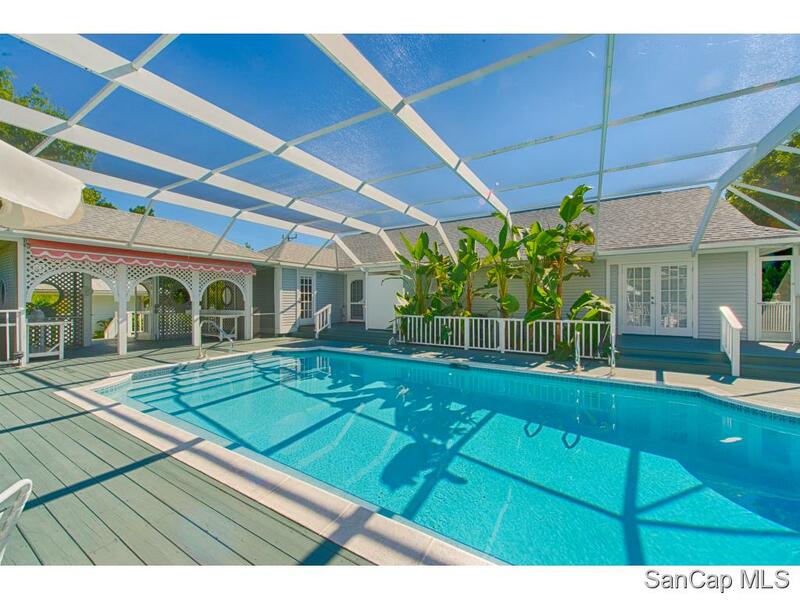 1 new sale: 1121 Schefflera Ct 4/4.5 listed for $3.99M. This entry was posted in Captiva real estate, Florida property, Florida real estate, Real estate, Sanibel Island, Sanibel real estate, SanibelSusan, SanibelSusan's Blog and tagged 4th of July Events, Captiva Island, Ding Darling, Donuts, Economic Growth, Family Friendly, Federal Duck Stamps, Florida, Nature Lovers, Real estate, Sanibel Island, SanibelSusan, Trip Advisor Awards by SanibelSusan. Bookmark the permalink.